Wherever it may take you"
Dream of your next Double Century Sunrise!! and shows you the detailed version of the calendar complete with Registration Open Date, Early Bird Discount Date, Late Fee Date, Registration Close Date, Volunteer Ride Date, and a link to easily Volunteer for each of the Doubles. We do our best to not have any Double Centuries in the series on the same day. We are fully aware that date conflicts are not good for either event reducing the number of riders and the number of volunteers available for both events. Each of the California Triple Crown Double Centuries is a Major Adventure in itself!! A BIG Thanks to the Ride Organizers of each of these Double Centuries. Please thank them for the many hours they work to organize these incredibly complicated events. Over the years, we have spoken to many cyclists who picked a difficult Double Century as their first. In many cases, they weren't able to complete it because of mechanical, biomechanical, or mental challenges. We are convinced that these cyclists could have completed one of the flatter Doubles with a great sense of accomplishment. They could have found that riding Doubles is challenging but also fun!! Not a single one of these rides is easy. Each will provide you with a "Personal Growth Experience". Don't make the mistake of moving into the tougher Doubles until you're ready - mechanically, biomechanically, and mentally!! Once you're well prepared, the California Triple Crown Double Century series has plenty of challenges for you. You become part of a group of select Bicyclists and have the tremendous satisfaction of completing one of the most difficult Bicycling events anywhere!! The California Triple Crown is a small, completely volunteer organization established to publish the schedule and the results of these rides. 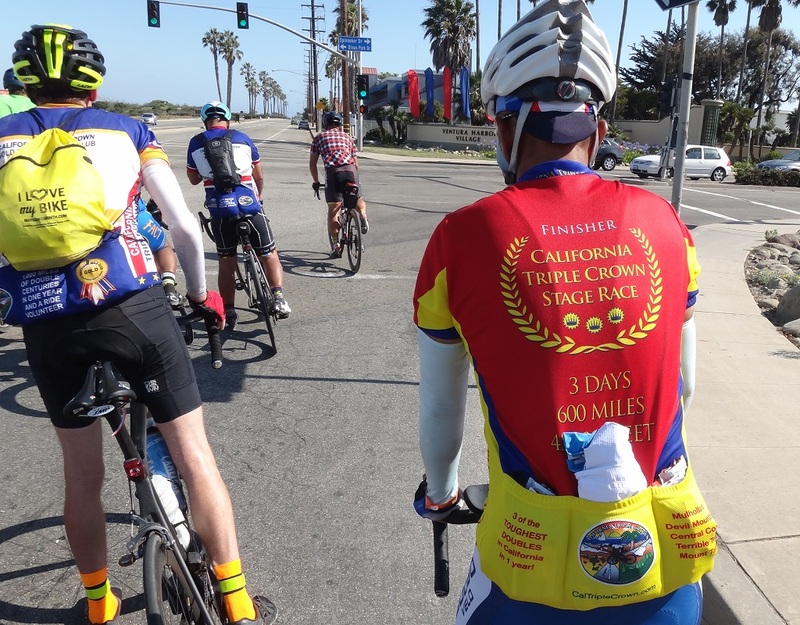 In order to receive California Triple Crown Credit for completing one of these Double Centuries, you must be on the Official Finisher's list for the 200 Miles as published by the Ride Organizer. Please be sure that the exact spelling of your First and Last Name is the same when you register for the California Triple Crown and when you register for each of the Double Centuries because we post the results of the Double Centuries to the California Triple Crown records based on your First and Last Name. Any rider that uses the spring Southern Inyo Double as their first ever Double, upon completion will get an additional discount of $25.00 off the entry price of the summer Southern Inyo by Moonlight Double Century. The discount will be off the price the Southern Inyo by Moonlight Double was on the day you registered for the spring Double. Or first time double riders can deduct $25.00 from the bundle price. Any current CTC riders that recruit a new rider can also deduct $25.00 from the bundle price. The new rider must mention the recruiters name at time of registration for both to get the discount." We believe this new pricing policy by Hugh to encourage new Double Century riders is the first time an organizer has implemented such a policy. Please spread the word!! Dzung Dang, the organizer of the Carmel Valley Double, wrote: "For this year, the Carmel Valley Double will start and finish in King City to avoid extreme high heat during midday. Also, lodging is more reasonably priced in King City. For camping enthusiasts we have tent and RV camping at the start / finish location - Salinas Valley Fairgrounds. Now that Highway 1 is open with the newly constructed Pfeiffer Canyon Bridge we will have the original loop course with two scenic climbs: Carmel Valley Rd. in the morning, and Nacimiento-Fergusson Rd. in the afternoon. Lunch will be served along the coast in Big Sur at mile 103. 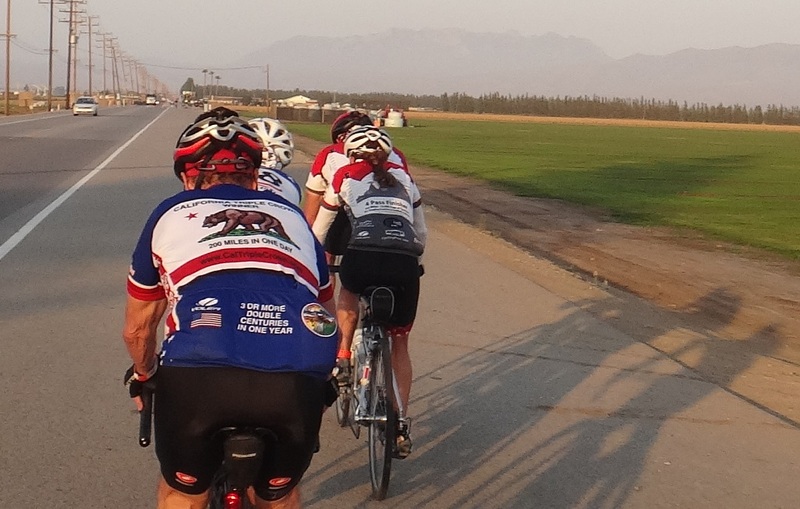 The updated ride description is HERE"
The California Triple Crown records one ride credit and/or one volunteer credit to each event based on the results posted by the Ride Organizers. If you want these rides to continue, please bring your friends and families along and ask the ride organizer how they can help make the ride a success!! If you want these rides to improve, volunteer and do your part to make them better!! Those who say it can't be done are usually interrupted by others doing it!! Accept The Challenge: Be A California Triple Crown Winner!! One final thought: Please keep Andrew Valiunas in your thoughts and prayers. Andrew was struck by a vehicle on December 20 on Mulholland Highway. He had surgery for a broken femur, and also has a shattered shoulder as well as many broken ribs. Please help Andrew cover his medical expenses: copays and physical therapy and other costs that will be needed as his leg and shoulder heal by contributing HERE. Andrew is an amazing cyclist and a tough guy but an injury like this at 67 years of age is brutal no matter how tough you are. Sadly, we can't bounce back from these things like when we were young. He wants to say thank you to all who have helped him. And that he will be riding again one day! Let's help him get back on his bicycle! is a completely volunteer organization.